An excerpt of the data available at Gapminder.org. For each of 142 countries, the package provides values for life expectancy, GDP per capita, and population, every five years, from 1952 to 2007. What is gapminder good for? Excerpt from the Gapminder data. The main object in this package is the gapminder data frame or "tibble". There are other goodies, such as the data in tab delimited form, a larger unfiltered dataset, premade color schemes for the countries and continents, and ISO 3166-1 country codes. Per-capita GDP (Gross domestic product) is given in units of international dollars, "a hypothetical unit of currency that has the same purchasing power parity that the U.S. dollar had in the United States at a given point in time" -- 2005, in this case. gapminder_unfiltered: more lightly filtered and therefore about twice as many rows. Note: this package exists for the purpose of teaching and making code examples. It is an excerpt of data found in specific spreadsheets on Gapminder.org circa 2010. It is not a definitive source of socioeconomic data and I don't update it. Use other data sources if it's important to have the current best estimate of these statistics. country_colors and continent_colors are provided as character vectors where elements are hex colors and the names are countries or continents. #>          Nigeria            Egypt         Ethiopia Congo, Dem. Rep.
#>        "#7F3B08"        "#833D07"        "#873F07"        "#8B4107"
#> "#7F3B08" "#A50026" "#40004B" "#276419" "#313695"
The country_codes data frame provides ISO 3166-1 country codes for all the countries in the gapminder and gapminder_unfiltered data frames. This can be used to practice joining or merging. I have used this excerpt in STAT 545 since 2008 and, more recently, in R-flavored Software Carpentry Workshops and a ggplot2 tutorial. 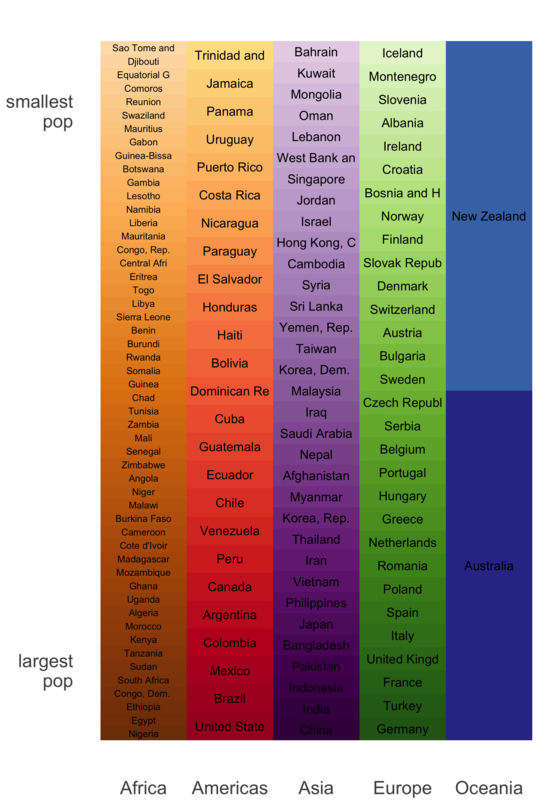 gapminder is very useful for teaching novices data wrangling and visualization in R.
There are 12 rows for each country in gapminder, i.e. complete data for 1952, 1955, ..., 2007. The two factors provide opportunities to demonstrate factor handling, in aggregation and visualization, for factors with very few and very many levels. 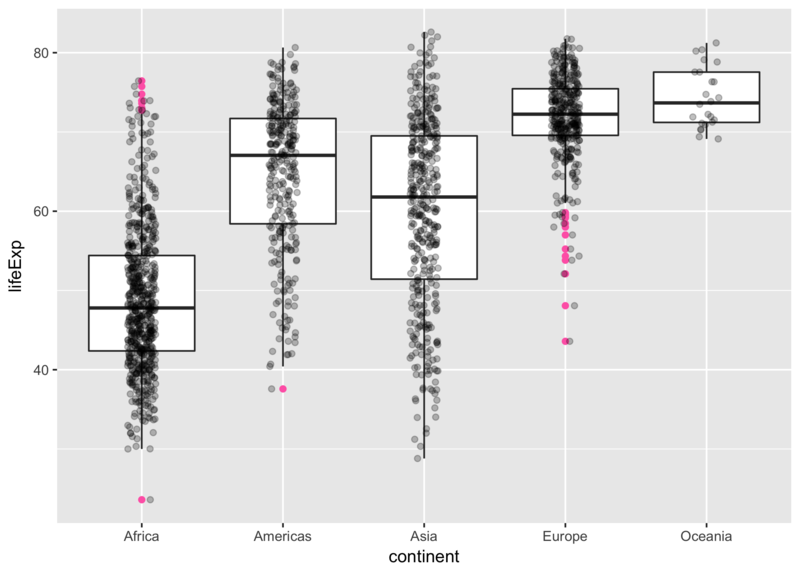 The four quantitative variables are generally quite correlated with each other and these trends have interesting relationships to country and continent, so you will find that simple plots and aggregations tell a reasonable story and are not completely boring. 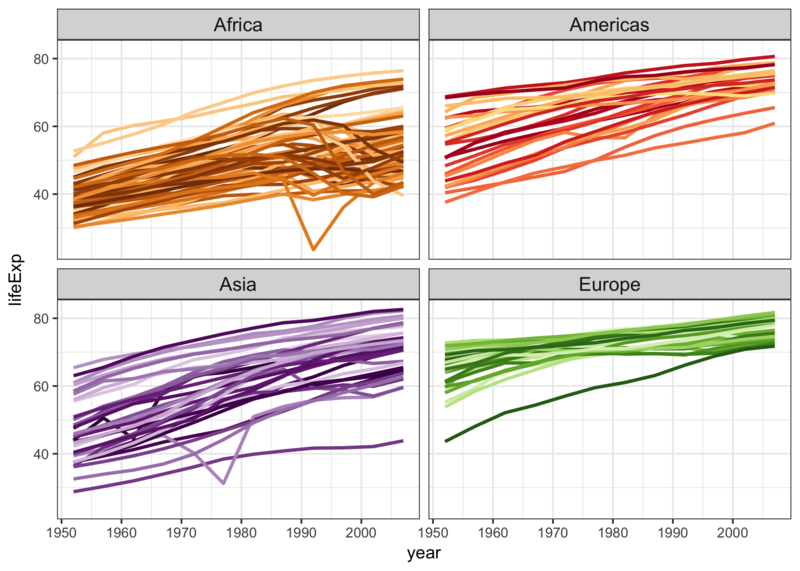 Visualization of the temporal trends in life expectancy, by country, is particularly rewarding, since there are several countries with sharp drops due to political upheaval. This then motivates more systematic investigations via data aggregation to proactively identify all countries whose data exhibits certain properties. Data cleaning code cannot be clean. It's a sort of sin eater. The [`data-raw`](data-raw) directory contains the Excel spreadsheets downloaded from [Gapminder](http://www.gapminder.org) in 2008 and 2009 and all the scripts necessary to create everything in this package, in raw and "compiled notebook" form. gapminder-unfiltered.tsv: the larger dataset available via library("gapminder"); gapminder_unfiltered. Run this command to get info on how to cite this package. If you've installed gapminder from CRAN, the year will be populated and populated correctly (unlike below). #>   Jennifer Bryan (NA). gapminder: Data from Gapminder. country_codes is a new data frame that contains ISO 3166-1 country codes (#16 @jrebane). Import tibble::tibble(), so tibble printing is used out of the box. Moved delimited files for practicing data import into inst/extdata/. Therefore, these are now accessible after installation at, e.g., system.file("extdata", "gapminder.tsv", package = "gapminder"). Clarify that this package is not maintained as a definitive data source, rather it's for making code examples and teaching. Stability is now very important. Improved citability, e.g. added the "concept" DOI that links to a list of all version to DESCRIPTION and README. README also shows the use of citation(). Added the tbl_df class to the gapminder data frame, which is advantageous for users of the dplyr package. Changed (corrected?) the population variable from numeric to integer. Affected India (all years) and China (1952). Moved imputation of 1952 China data earlier in the data cleaning process, which added a row to inst/gapminder-unfiltered.tsv. Added the gapminder_unfiltered data frame. It's the data frame gapminder came from, but is less heavily filtered (previously available only in inst/gapminder-unfiltered.tsv). Added tab-delimited files for the country and continent colors, inst/continent-colors.tsv and inst/country-colors.tsv. 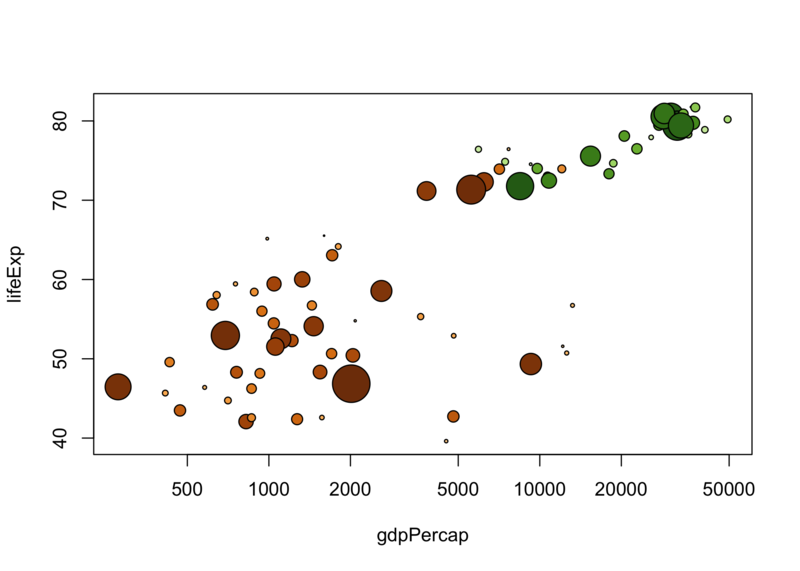 Added description of the "international dollars" in which GDP per capita is reported (thanks @aammd, #5).